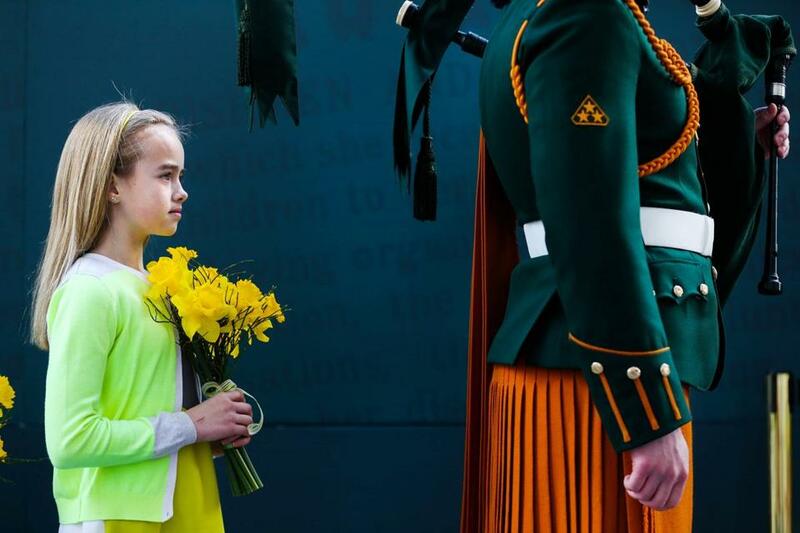 A young girl holds flowers during the Easter Sunday Commemoration Ceremony at the General Post Office March 27 in Dublin. Twenty-five years ago, when the 75th anniversary of the Easter Rising rolled around, it passed here with little fanfare. The war was still on in the North. The Provisional Irish Republican Army was still planting bombs and killing people, and given that the IRA portrayed itself as the natural successors to the rebels of 1916, many Irish were reluctant to commemorate, much less celebrate, their revolutionary roots. On the Monday after Easter in 1916, a few hundred rebels seized the General Post Office and a handful of other sites in Dublin. They declared an Irish Republic and challenged the British Empire. Initially caught off guard, the British responded with overwhelming force. After six days of fighting that killed nearly 500 people — half of them civilians, 40 of them children — and left much of central Dublin in ruins, the rebels surrendered. The Rising was a quixotic, unmitigated military failure and was opposed by the majority of Irish. But after the British executed 15 of the Rising’s leaders, Irish public opinion changed. Nationalist fervor grew, and by 1919 the British found themselves in the midst of a full-scale rebellion, which ultimately led to independence for 26 of Ireland’s 32 counties. So the Rising is seen as the birth of the modern Republic of Ireland. But on April 24, 1991, Robert Ballagh, one of Ireland’s most prominent artists, stood in the Garden of Remembrance, just up the street from the GPO where the Rising began, shaking his head. The garden is dedicated to those who gave their lives in the pursuit of Irish freedom. Back in 1991, Ballagh led a small private group that organized a series of 1916 commemorations after the government demurred. To honor the actual 75th anniversary of the Rising, a lone piper played a mournful air, and school children dropped Easter lilies into the reflective pool at the Garden of Remembrance. Only a few people were there to watch. Fast forward 25 years, and the centenary of the Easter Rising has been a far different affair. The Irish government, which more or less ignored the 75th anniversary, has spent an enormous amount of time and more than $50 million on commemorating the 100th. The events will last all year but have been most prominent between Easter and April 24, the actual anniversary of the Rising. The scope, from state ceremonies to community-based programs to functions held for the diaspora from Boston to Brisbane, is unprecedented. When I caught up with Ballagh in Dublin recently, he laughed ruefully, recalling the 75th anniversary that was so memorably ignored. The war in the North is over. The Republic of Ireland got rich, went broke, and is financially rising again, the world’s most globalized economy. And the Irish are looking at their history not with averted eyes but wizened ones. Five years ago, Queen Elizabeth II visited the Garden of Remembrance, laying a wreath in honor of those who died fighting her empire. It was the first visit by a British monarch to the lost colony that became the Republic of Ireland, and it symbolized, more than anything else, an end to Anglo-Irish hostilities, the beginning of a new chapter of cordial relations between neighbors as equals. Maurice Manning, chancellor of the National University of Ireland and chairman of the group that advised the government on how to commemorate the Rising, said the goal was to create a series of events and initiatives that were historically accurate and inclusive. Some had suggested that Sinn Féin, the party aligned with the IRA, would try to hijack the centenary, to consolidate its position as one of the country’s biggest opposition parties. Manning scoffs at the notion that any individual or group could hijack the commemorations for political gain. He said the physical legacy will be owned by the Irish people: a freedom trail, inspired by Boston’s, that will highlight various sites that played a role in the Rising; a museum and interpretive center in the General Post Office; a similar center at Kilmainham Gaol, where the Rising’s leaders were executed. “No one can hijack that,” Manning said. Newly digitized files of accounts given by those who applied for military pensions, meanwhile, will allow anyone to read the first-person accounts of people who endured and survived the Rising. For all the hand-wringing, for all the wariness some had expressed about devoting so much of the national consciousness to remember an act of violent nationalism, the commemorations have come off well so far. They have been a cause for reflection more than triumphalism. Humphreys herself embodies the complexity of memorializing an event that has different meanings for different Irish people. Her grandfather was a northern Protestant who signed the Ulster Covenant in 1912, vowing to fight against Home Rule. Humphreys said it was important to look at the Rising not just from the perspective of Irish nationalists, but British unionists, too. “It shows how much we’ve evolved as a country,” said Humphreys. If the reticence to commemorate the 75th anniversary of the Rising hinted at a certain insecurity in Ireland, the robust attention paid to the centenary suggests a new level of maturity. With confidence rising, it has been easier to fully embrace the Easter Rising. Perhaps most significantly, the actions of the rebels of 1916 have been placed in historical context, and individuals have been humanized more than mythologized. Inner city Dublin of that time had some of the worst poverty in Europe. In rural areas, more land was being consolidated in fewer hands. “The Ireland of the early 20th century was a complex place where the shops, restaurants, and back rooms of radical Dublin were alive with the conversations of a dynamic mixture of feminists, socialists, radicals, nationalists, anti-imperialists, and the many other ideologists compelled, in their different ways, to dream of a new and better Ireland,” said Higgins. As Higgins sees it, the Rising was far more than anti-British. It was anti-imperialist. And while some historical revisionists have complained that the Rising commemorations have sanitized or romanticized the violence that was carried out by a vanguard movement without a popular mandate, Higgins said British “supremacist and militarist imperialism” had largely escaped retrospection. Some worried that Sinn Féin would milk the centenary for political gain. But that hasn’t happened, and those fears appear unfounded. There have been so many varied commemorations, especially at the local level, that it would be impossible for any individual political party to appropriate the centenary for its purposes. In 1984, Martin Ferris was captured off the coast of his native Kerry on board a ship carrying seven tons of weapons that Boston gangsters had assembled for the IRA. Ferris was betrayed by another IRA commander who wanted him out of the way. After he got out of prison, Ferris became part of the Sinn Féin leadership that pushed for an IRA cease-fire and the peace process in Northern Ireland. Ferris believes the reluctance among some to highlight the Easter Rising has nothing to do with Sinn Féin. Noting that there are 1,700 homeless children living mostly in and around Dublin, the Rev. Peter McVerry, a priest who works with the homeless, said the 1916 commemorations make a mockery of the Proclamation. McVerry said the number of homeless children, many of whom live in hotels with their families, could nearly double in the coming year. For McVerry and others who work with the underprivileged, there is a disturbing level of self-congratulation when so much of what the Rising’s leaders called for is unrealized. In more recent years, Ireland has had to confront how far it had strayed from the Proclamation’s heady idealism, especially when it came to the treatment of the nation’s children in a newly independent country. Poor children and orphans, in particular, were confined to institutions run by Catholic orders that served as de facto public social service networks, where physical and sexual abuse was rampant. “Fallen women” who had the misfortune of being poor or pregnant outside marriage were forced to work in laundries for no pay. That reckoning has been painful. Ferris doesn’t buy the argument, pushed by some revisionists, that the Rising commemorations are providing succor to the small band of republican dissidents who continue to sporadically resort to violence, mostly in Northern Ireland. Of course, that’s what the vast majority of Irish people said about the IRA that Ferris joined in the 1970s. And the truth is, those who mounted the Rising did so without a popular mandate. Tens of thousands of Irishmen were serving with British forces in World War I at the time, which explains why some Dublin women spit at the rebels as they were marched off after surrendering. It was only after the British authorities executed the Rising’s leaders that public opinion began to swing toward the rebels. It was a similar British overreaction to the IRA in Northern Ireland in the 1970s, with the introduction of internment without trial of suspected IRA members who often turned out to be innocent Catholics. That dramatically escalated the numbers joining the IRA. The harassment of suspected IRA men did much to create actual IRA men. But that is not an analysis that is politically correct or popular at this time, when the emphasis is how chummy the Republic of Ireland and the United Kingdom have become. One of the ironies not explicitly talked about either is the Dublin that gleams 100 years after much of its center was left in rubble. Many of its shops are the same chain stores you’d find in any provincial English city. That would probably horrify many of the Rising’s leaders, who were not willing to settle for Home Rule, a sort of quasi-independence that came with an unacceptable allegiance to the Crown. They wanted an Irish cultural revolution as much as an actual rebellion. The Easter Rising commemorations are a dry run for what could prove to be an even more sensitive, contentious subject, the centenary of the Irish Civil War, which broke out in 1922. Ireland’s two biggest political parties, Fine Gael and Fianna Fáil, trace their roots to the civil war. Fine Gael’s predecessors accepted the treaty that eventually saw 26 of Ireland’s 32 counties win independence. Fianna Fáil’s predecessors rejected the treaty and fought on against their erstwhile comrades. There is little policy difference between the parties, but they have steadfastly refused to join forces, even after a general election just before Easter that left the Rising commemorations to be overseen by a caretaker government. It would be a remarkable achievement if one of the byproducts of the newfound confidence in Ireland to confront its tortured history is the eventual coalition of Fine Gael and Fianna Fáil. But, one revolution at a time. Humphreys says the 1916 commemorations have gone a long way toward reducing anxiety over how to confront the memories and the legacies of the civil war. The civil war will have to wait. Next up are the commemorations for the War of Independence, which began in 1919 and ended in 1921. It used to be said there was no future in Ireland, only the past happening over and over again. Now the future is commemorating the past, over and over again, but confidently. Kevin Cullen is a Globe columnist and the Globe’s former Dublin and London bureau chief.